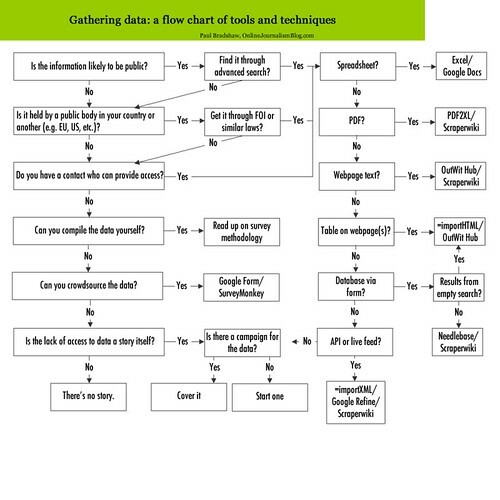 One of the most frequently encountered ways of sharing small datasets is in the form of Excel spreadsheet (.xls) files, notwithstanding all that can be said In Praise of CSV😉 The natural application for opening these files is Microsoft Excel, but what if you don’t have a copy of Excel available? Once loaded, you get a preview view..
You can tidy up the data that you are going to use in your project via the preview panel. In this case, I’m going to ignore the leading lines and just generate a dataset that I can export directly as a CSV file once I’ve got the data into my project. So that’s one way of using Google Refine as a simple file converter service that allows you to preview and to a certain extent shape the data in XLS spreadsheet, as well as converting it to other file types. 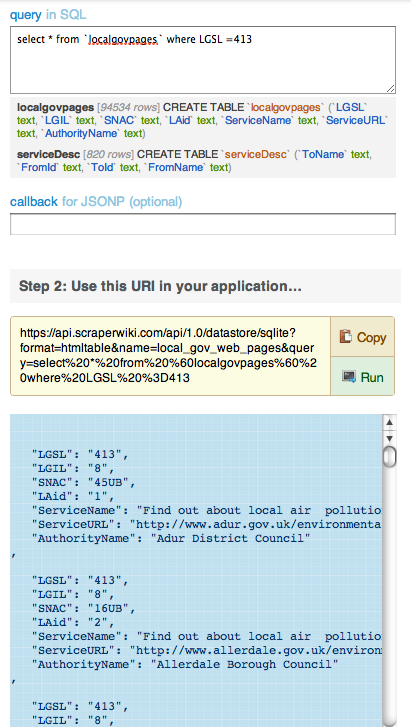 The second approach I want to mention is to use a really handy Python software library (xlrd – Excel Reader) in Scraperwiki. The Scraperwiki tutorial on Excel scraping gives a great example of how to get started, which I cribbed wholesale to produce the following snippet. 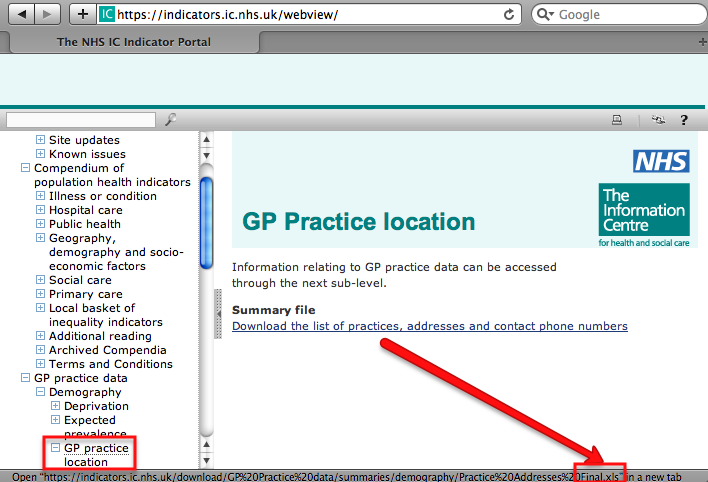 You can find my scraper here: UK NHS GP Practices Lookup. 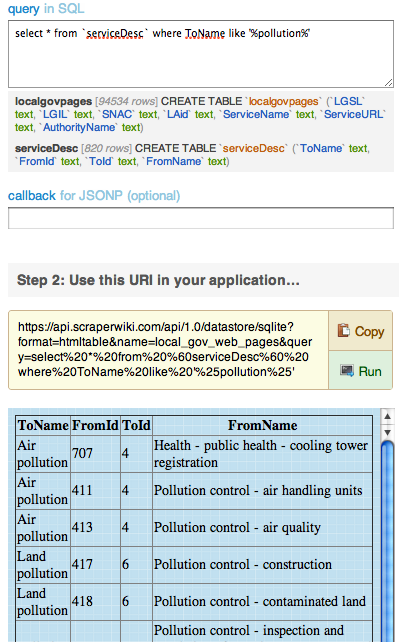 What’s handy about this approach is that having scraped the spreadsheet data into a Scraperwiki database, I can now query it as database data via the Scraperwiki API. PS R is capable of importing Excel files, I think, but the libraries I found don’t seem to compile onto Max OS/X? 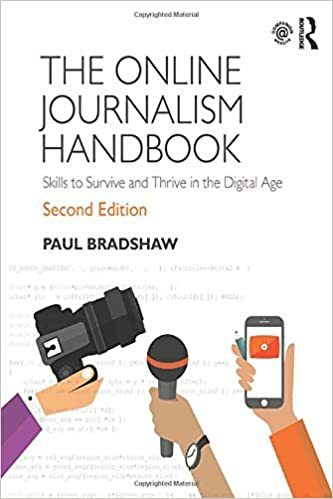 This entry was posted in online journalism and tagged data, onlinejournalismblog on April 30, 2012 by Paul Bradshaw. Some posts I get a little bit twitchy about writing. Accessing and Visualising Sentencing Data for Local Courts was one, and this is another: exploring practice level prescription data (get the data). One of the reasons it feels “dangerous” is that the rationale behind the post is to demonstrate some of the mechanics of engaging with the data at a context free level, devoid of any real consideration about what the data represents, whilst using a data set that does have meaning, the interpretation of which can be used as the basis of making judgements about various geographical areas, for example. The prescription data includes data at the level of item counts by drug name or prescription item per month for each practice. Trivially, we might do something like take the count of methadone prescriptions for each practice, and plot a map sizing points at the location of each practice by the number of methadone prescriptions by that practice. All well and good if we bear in mind the fact the the data hasn’t been normalised by the size of the practice, doesn’t take into account the area over which the patients are distributed, doesn’t take into account the demographics of the practices constituency (or recognise that a particular practice may host a special clinic, or the sample month may have included an event that drew in a large transient population with a particular condition, or whatever). A good example to illustrate this taken from another context might be “murder density” in London. It wouldn’t surprise me if somewhere like Russell Square came out as a hot spot – not because there are lots of murders there, but because a bomb went off on a single occasion killing multiple people… Another example of “crime hot spots” might well be courts or police stations, places that end up being used as default/placeholder locations if the actual location of crime isn’t known. And so on. The analyst responsible for creating quick and dirty sketch maps will hopefully be mindful of the factors that haven’t been addressed in the construction of a sketch, and will consequently treat with suspicion any result unless they’ve satisfied themselves that various factors have been taken into account, or discount particular results that are not the current focus of the question they are asking themselves of the data in a particular way. Another reason I’m a little twitchy about this post relates to describing certain skills in an open and searchable/publicly discoverable forum. (This is one reason why folk often demonstrate core skills on “safe” datasets or randomly generated data files.) In the post Googling Nasties and Oopses on University and Public Sector Websites, a commenter asked: “is it really ethical to post that information?” in the context of an example showing how to search for confidential spreadsheet information using a web search engine. I could imagine a similar charge being leveled at a post that describes certain sorts of data wrangling skills. Maybe some areas of knowledge should be limited to the priesthood..? Note: Due to the large file size (over 500MB) standard spreadsheet applications will not be able to handle the volumes of data contained in the monthly datasets. 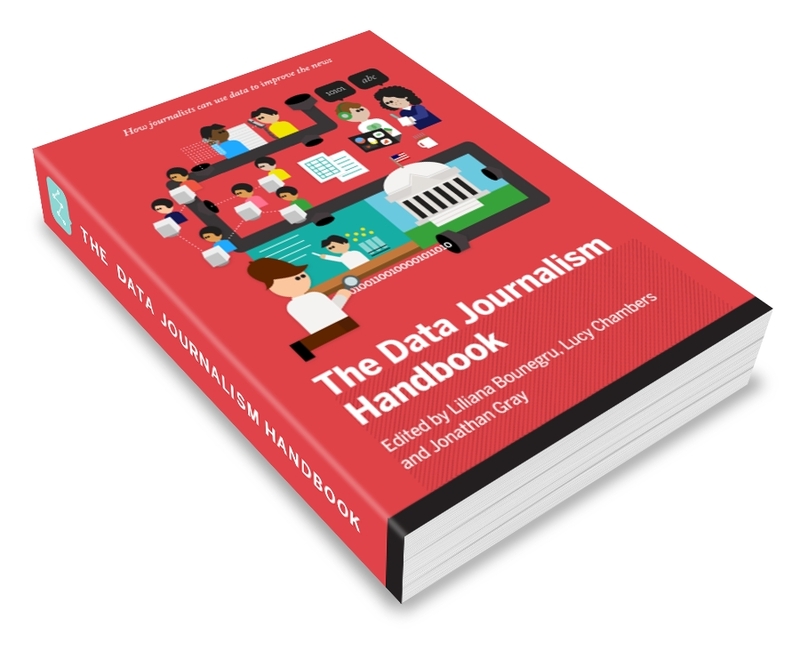 Data users will need to analyse the information using specialist data-handling software. Hmmm… that’s not very accessible is it?! Download the data (all 500MB+ of it – it’s published unzipped/uncompressed (a zipped version comes in at a bit less than 100MB)) and launch a terminal. 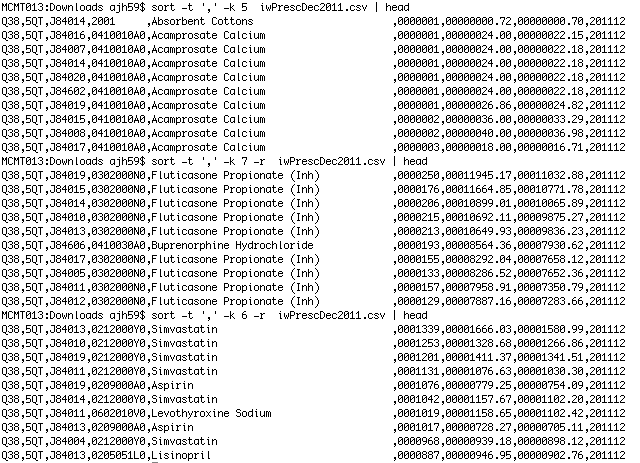 I downloaded the December 2011 files as nhsPracticesDec2011.csv and nhsPrescribingDataDec2011.CSV so those are the filenames I’ll be using. 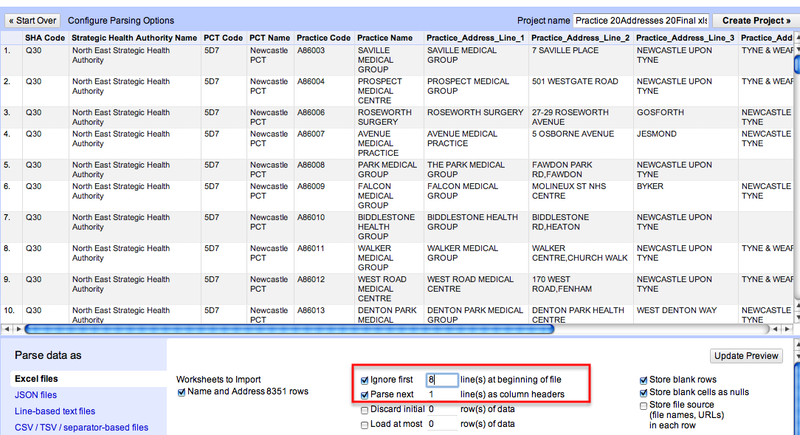 The file wightPracDec2011.csv should now contain details of practices (one per row) based on the Isle of Wight. We can inspect the first few lines of the file using the head command, or use more to scroll through the data one page at a time (hit space bar to move on a page, ESCape to exit). 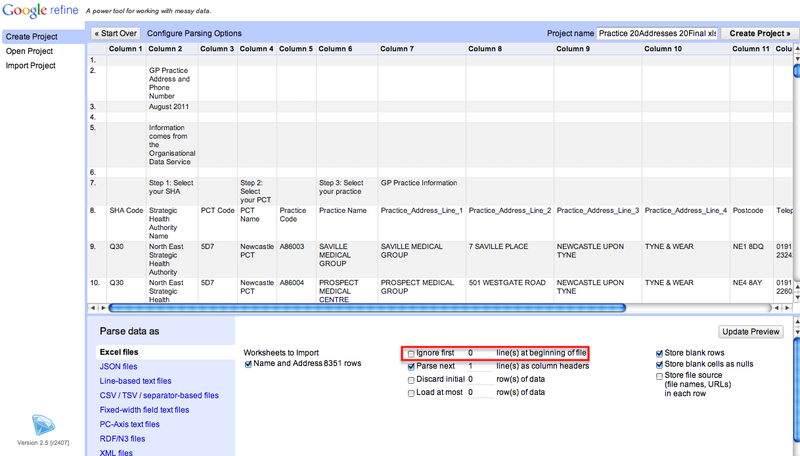 From looking at the data file itslef, along with the prescribing data release notes/glossary, we can see that each practice has a unique identifier. From previewing the head of the prescription data itself, as well as from the documentation, we know that the large prescription data file contains identifiers for each practice too. So based on the previous steps, can you figure out how to pull out the rows from the prescriptions file that relate to drugs issued by the Ventnor medical centre, which has code J84003? Like this, maybe? This lists column two of the file wightPracDec2011.csv where columns are comma delimited. One problem with looking at those results is that we can’t obviously recognise the practice. (That might be a good thing, especially if we looked at item counts in increasing order… Whilst we don’t know how many patients were in receipt of one or more items of drug x if 500 or so items were prescribed in the reporting period across several practices, if there is only one item of a particular drug prescribed for one practice, then we’re down to one patient in receipt of that item across the island, which may be enough to identify them…) I leave it as an exercise for the reader to work out how you might reconcile the practice codes with practice names (Merging Datasets with Common Columns in Google Refine might be one way? Merging Two Different Datasets Containing a Common Column With R and R-Studio another..?). And this is where we now start to need taking a little care… Scanning through that data by eye, a bit of quick mental arithmetic (divide column 7 by column 6) suggests that the unit price for peppermint oil is different across practices. So is there a good reason for this? I would guess that the practices may well be describing different volumes of peppermint oil as single prescription items, which makes a quick item cost calculation largely meaningless? I guess we need to check the data glossary/documentation to confirm (or deny) this? 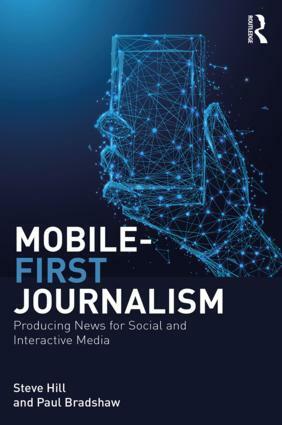 This entry was posted in online journalism and tagged data, onlinejournalismblog on April 27, 2012 by Paul Bradshaw.